Everyone has one these days and if you don’t, well then this post wont be much help. I am talking about the smartphone. With the growing number of smartphone users, more phone applications hit the market to make our life a bit easier. Especially in places, we are not familiar with applications are very helpful. Traveling has become a whole lot easier with certain phone applications. This iPhone app will provide you with timetables for the S-Bahn, U-Bahn, bus, and streetcars in Berlin. It suggests the best connections from the station you want to leave from to the station you wish to go to. You can download the basic version for free. As Berlin is the mecca for street art, this iPhone app is very recommendable. It localizes street art throughout the city and you can get information on the pieces and the artists. Also, users can select tours, rate and comment on pictures and send their own suggestions/discoveries. Downloading this app is free. If you prefer more traditional artwork and would like to do a tour of one or more of the museums and don’t know where to start to get this application which will give you short descriptions of all the museums in the city, their masterpieces, and current exhibitions. This free application will keep you updated on what is going on in Berlin. On a map, it will show you where to find cool restaurants, bars, and clubs, but also concerts, movies or things to do with your children. 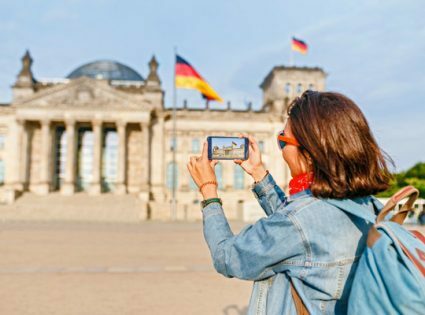 This application is not only useful for when you are staying in Berlin, but this free application will provide users with all different sorts of information about his or her surroundings. The nearest banks, restaurants, ATMs, hospital, gas stations, supermarket, etc. from wherever you are at any time you might need it. Do you rely much on smartphones when you are traveling? What is your experience? Do you have any other app recommendations for Berlin in particular?